Philadelphia Sign, (“PSCO”), a global leader in sign design, fabrication, installation and maintenance, announces the addition of ID Associates, (“ID”), to the PSCO family of companies. The addition of ID Associates to the PSCO family broadens its reach with a physical presence in the Southeast and beyond. Palmyra, NJ, January 14, 2019 --(PR.com)-- Philadelphia Sign, (“PSCO”), a global leader in sign design, fabrication, installation and maintenance, announces the addition of ID Associates, (“ID”), to the PSCO family of companies. 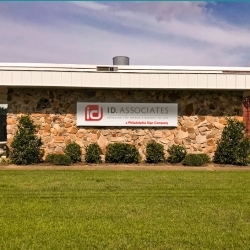 ID Associates, based in Dothan, AL is a national sign manufacturer. The addition of ID Associates to the PSCO family broadens its reach with a physical presence in the Southeast and beyond. This expansion furthers the company’s commitment to its customers, particularly those with conversions and national sign programs. Since incorporating in May of 1999, ID Associates has become a national leader in the sign industry. This is attributable to the company’s dedication to manufacturing quality sign products, excellence in project management and by offering exceptional service. Under the new agreement, ID Associates will maintain business as usual. The two companies will capitalize on each other’s strengths, growing their signage offerings and business globally. ID provides interior and exterior signage solutions for some of the nation’s most recognizable companies in diverse markets including hospitality, fitness & health, automotive, financial, restaurants, and retail. Both ID Associates and Philadelphia Sign create signage that attracts and informs customers, and increases brand awareness. Philadelphia Sign is the country’s oldest turnkey national sign provider, and a recognized leader in sign design, fabrication, installation and maintenance. Specializing in branding and conversion programs, PSCO has earned the trust of the world’s top retail brands. Drawing on more than a century of experience, PSCO offers inspired design engineering, unlimited manufacturing capabilities and world class program management. Headquartered in Palmyra, New Jersey, Philadelphia Sign has five sign manufacturing facilities and offices, totaling 467,000 square feet in Palmyra, NJ, Pennsauken, NJ, Littleton, MA and most recently, Dothan, AL. Complemented by additional sales and service locations in Chicago, IL, Naples, FL, Las Vegas,NV, San Francisco, CA, Virginia Beach, VA, and Knoxville, TN, and Long Island, NY. Philadelphia Sign with its partner in New England and in the UK formed the International Sign Alliance (TISA) to connect our customer’s brand with their audience – globally, regionally and locally.